THIMPHU, BHUTAN -NOV 6, 2008: Ceremonial dancers line up for the crowning ceremony of his Majesty Jigme Khesar Namgyel Wangchuck, 28, at the Dratshang Kuenra Tashichho Dzong November 6, 2008 in Thimphu, Bhutan. The young Bhutanese king, an Oxford-educated bachelor became the youngest reigning monarch on the planet today. He was handed the Raven Crown by his father, the former King Jigme Singye Wangchuck, in an ornate ceremony in Thimpu, the capital. 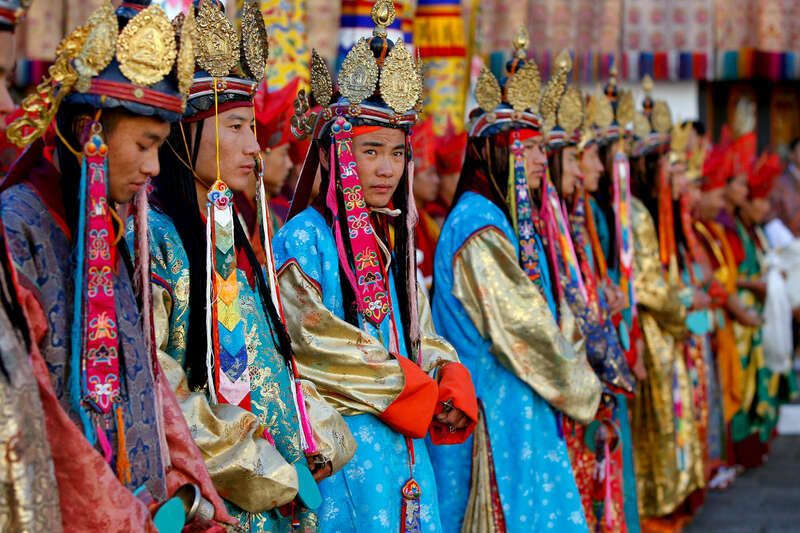 The tiny Himalayan kingdom, a Buddhist nation of 635,000 people is wedged between China and India .